Michael Blackman has flip flopped residencies around the English speaking world. Born in Vancouver, Canada. Spent his formative years in Australia. Teen years in the USA. And for some time has called Australia home. Though it was Ace Frehley who first inspired him to play guitar, it was Hendrix, and ultimately Hawkwind's Huw Lloyd Langton that got Michael serious about the instrument. 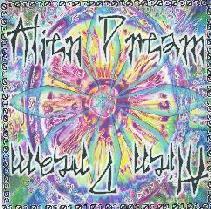 He first conceived Alien Dream in 1994, though it wasn't until 2000 that the first self-titled Alien Dream CD was ready for release. Since then there have been a total of five Alien Dream CD's, plus the excellent Space Mirrors, a duo band (plus guests) between Michael and Russian keyboardist Alisa Coral (see review/interview in AI #27). The common thread across all the Alien Dream CD's is Michael flair for lulling, haunting, uplifting and eternally cosmic melodies. This is music that could easily be lacking without a vocalist, but Michael's excellence in composition and execution make each Alien Dream album an otherworldly Space Rock experience. The self-titled Alien Dream CD is a strong debut, introducing us to Michael's completely cosmic and gorgeously psychedelic brand of space rock. Songs like "Alien Dream" and "Full Moon" are the most overtly Hawkwind influenced. "Awake In A Dream" begins as a serenely melodic piano driven piece, with a spacey, almost new age feel, until the guitar takes over to bring the song to a more rocking close. This heavenly vs. rock mix is kicked up a notch on "Hypnosis", combining a lulling piano melody with a searing, but equally melodic guitar style, to create an alien styled of space-prog. Other highlights include "Black Hawk", which features a very cool freaky looped guitar effect backed by space atmospherics, a driving metallic pulse, and bits of alien electronics. "Fire Dance" has an Oriental flavor and didgeridoo. And Michael's wife Renee contributes lovely "vocal mantra" to "Rain Chant". But among my favorite tracks of the set are "Ethereal Pilot", a mind-bending cosmic psychedelic guitar-fest, and "Morning Dew On White Sand", a nearly 7 minute bubbling psychedelic tension builder that would have made a fantastic intro to an extended work. Michael's upgraded equipment and contributions from Keith Kniveton and Steve Eyre on keyboards and synths make an incredible difference on his sophomore release, Dogon Dance. "Brain Scan" opens the set and is an intense, rumbling space rocking intro piece with dual guitars, cosmic keys and spoken word bits from Michael and Renee. Some of Michael's best work combines space rock and progressive influences and "Alien Warp" is a primo example. Soaring guitar melodies and synths and symphonic keyboards are peppered with chattering alien synths. The title track has a rhythmic drive that reminds me of a Pressurehed song I don't recall the name of, but the jamming, somewhat Bluesy, space guitar, proggy spacey keys and ethereal vocals are pure Alien Dream. An excellent song. Fans of the Space Mirrors CD will hear the weight of Michael's influence on that project on "Planet Chaos", an intense space jam with multiple rocking guitar parts. "Starry Nights & Orbiting Dreams" is an easy paced space rocker with some of the best melodic guitar work on the album. At 9 minutes "Stardust" is my favorite of the set, and one of the longer Alien Dream tracks on any of the albums, moving through multiple themes, mostly with a haunting heavy space atmospheric edge and a powerful sense of thematic development, and the usual complimenting layers of guitars. "Moons & Stardust" is a similar and equally strong track that closes the set. 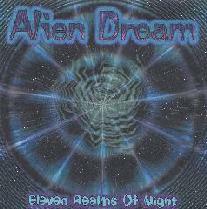 Eleven Realms Of Night opens with the "Eleven Realms Of Night" intro, a spoken word piece with an angelic keyboard driven vibe that leads into the main title track segment, a steady paced melodic space-prog piece that sets the tone for what is the most peaceful and trance inducing Alien Dream album to date. It also has a large number of very short tracks, though each flows from one to the next such that I wonder if this isn't a concept album of sorts. It really does play like one extended work. "Space Warp Dreams" is a standout that has a definite Tangerine Dream sound. The album is a beautiful, mind expanding 42 minutes that can only be appreciated when heard from start to finish, though it also places the least emphasis on rock elements of any Alien Dream album I've heard ("Beyond The Bounds Of Reality" and "Hallucinations" are exceptions). So it's little surprise that it's more keyboard heavy with the guitar playing a secondary role. But overall it's an enjoyable journey through some of the more blissful regions of space. 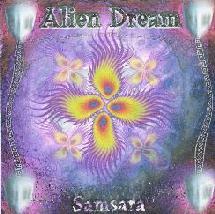 Though it retains all the elements of the Alien Dream sound heard on the previous albums, Samsara is overall one of the heavier rocking albums in the Alien Dream catalog. Michael blasts off the launching pad with "In The Beginning", an excellent cosmic space rocker with a steady bass and percussion drive, grinding and winding guitars, spacey keys and UFO synths. A solid opening track. I was pleased that this one and a few others stretch out a bit longer than the average Alien Dream song. "Magick Maya" is next and is another strong instrumental. It begins with a dark and eerie mood but soon transitions to a dreamier, uplifting space vibe. I love the guitar sound on this track which is kind of a shimmering-whining blend. It sounds great. Other highlights include "Alien Dreamscape". The main melodic theme is in that space-prog style that Michael does so well, but the song also takes off into heavier Hawkwind territory. "Demons Or Angels" is another winner that explores deep in space Hawkwind-ish realms. "When God's Dream" is the most intense rocker on the album and my favorite of the set. A really mind boggling space rock instrumental. "Tribal Astral Realms" is the 9 minute closing track and couldn't be more aptly titled, with a pounding tribal beat setting the pace for this fast paced space-prog metallic number. Song for song this is a really strong album. Following hot on the heels of Samsara is The Chaotic Nature Of Infinity, the latest from Alien Dream. The album opens with "Hidden Realms", a peaceful floating tune with alien spoken word bits and a simple but gorgeous guitar melody that brings to mind Marillion in the cosmos. "Wizards Brew" is a similarly floating space journey with a Middle-Eastern tribal kind of Hawkwind flavor. Michael's Space Mirrors partner, Alisa Coral, guests on two tracks: "Tiers Of Eternity" and "Fighting For Peace. The former is a decent tune, but "Fighting For Peace" is a really nifty space-prog rocker that yet again demonstrates Michael's ability to crank out simple yet fantastic melodies. It starts off slow but develops into one of my favorites of the set. "A Destiny With Eternity" is an interesting tune that begins with a quirky 60's novelty song sort of melody, reminding me of the type of whimsical music heard in a lot of beach flicks and comedies, the only difference being that this is happening within a space rock contrast. I love the cool shimmering trip guitar on "Drifting In Space" and "Lucid Dreams". "Shattered" starts off as a cool space rock 'n roller and one of the heaviest of the set, before settling into a wailing cosmic psychedelic groove. Excellent! "Time Traveller" is another heavy rocker with a spacey-proggy-metallic edge. And� I'm starting to sound like a broken record on this point� a really catchy, absorbing melody. "The Eyes Of Time" reminds me a lot of my fellow Columbus, Ohio cosmic rockers Quarkspace. (Note to Paul Williams that Michael would be THE guitarist for Quarkspace.) The title track rocks along for a couple minutes before launching into a potent driving space rocker. And "Reflections From The Serpents Eyes" closes the set and features liquid acid psych guitar and shooting space synths. A great combo! And overall this album is an outstanding set of instrumentals and probably my favorite of the five CD's covered in this article. The songs are all firmly in the 4-5 minute range, and I couldn't help but wish that Michael would stretch out a bit and tackle some lengthier tracks, which he periodically demonstrated on earlier albums he can do. But no matter, because he clearly excels at creating concise songs that work impressively well within a set limit. And it's his talent for creating absorbing melodic structures that make these solid instrumental "songs". AI: It was interesting to read your web site bio how your inspirations to become a guitarist started with Ace Frehley, moving on to Jimi Hendrix and Huw Lloyd Langton. Why do you think Huw and Hawkwind had such an impact over the other music that inspired you? Michael Blackman (MB): I was about 11 years old back in 1979 (the first time I heard "Rock n Roll all Night" by Kiss) It was probably the first time I ever really heard anything heavier than the Beatles. So it was one of those momentous buzz moments in my life when something new and exciting came along. The weird makeup and the wild concerts that I was told about� but I never saw them play live until 1995, then '97. I discovered Hendrix ("Purple Haze") a few years later on a jukebox somewhere in South Carolina, my family had moved there temporarily at the time, and I was so impressed by it I ended up buying every album I could find. Electric Ladyland really caught my attention because to me it is quite possibly Jimi's most inspired album. The kind of album you can listen to on the headphones and just drift away on a rainy day! From there on I found I had a real passion for listening to anything falling into or close to the genre of psychedelic music. I discovered the Doors by joining one of those mail order music clubs back then and just picking it out with several other cassettes. So there's me listening to all this "WEIRD" music as my friends would call it as they were trying to perfect the "art" of spinning on their heads and break dancing listening to all that rap music that was becoming so popular back then in the early 80's. They were very funny though! At that time I also enjoyed getting into the "old school metal" - bands like Black Sabbath, Ozzy, Motorhead, The Scorpions (I was really into their Blackout Album) and several other metal bands of that era. A few years later, after a bit of a sojourn across Australia, my brother, myself and a mate had a flat in Queensland ( a stones throw from an excellent beach and some very good mushroom fields, then Melbourne for a while�. Then off to Alice Springs. Roll on to 1989. I ended up discovering Hawkwind in Alice Springs of all places! I was hanging out with a crowd who were also into the art of practicing and exploring a sort of chemically stimulated version of Prana Udana. At some point a good friend told me I should listen to this band. As it turned out it was Hawkwinds Levitation album. (and I should add that when I heard this album I was in a completely natural state of mind) I was completely captivated by the soundscapes from the first two tracks: "Levitation" and "Motorway City" and found the entire album to be outstanding. The combined guitar playing of Huw Lloyd Langton and Dave Brock was simply beautiful and added to the mix those "off the planet" amazing swirling synth effects and solos from Tim Blake I had found the ultimate psychedelic band (or Space Rock band as I would later learn.) For me Hawkwind is a fantastic fusion of primal tribal music with futuristic, inspired sounds, visions and concepts and Huws guitar playing/soloing - the music - takes me off on a trip like no other guitarist or band ever has. I also highly recommend Huws solo albums. Like an Arrow (through the heart) is very cool! AI: How did you decide on the name Alien Dream? I ask because it's such a perfect name for the beautifully melodic brand of Space Rock you create. MB: I was studying audio engineering at a college here in Australia from 1993 to 1994. A friend of mine ran a 16 track analog recording studio and invited me to use his facilities during the last few months of my study to complete my practical recording and mixing as well as do a little work with him for some bands he was recording. He happened to have a shiny new Korg Wavestation there so when there was some free time I would play around with that. I ended up filling about two reels of Ampex � inch with all kinds of spaced out synth tracks (two of them 1- Fire Dance and 2- Rain Chant are on the first Alien Dream album.) During my informal "wavestation sessions" I came across a patch called "Alien Dreams" and I thought, hey that would be a very cool name for a music project and it seemed to suit very well the sounds I was creating at the time. 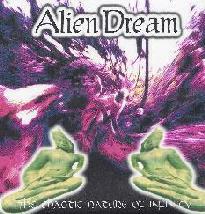 AI: You first conceived Alien Dream in 1994 but the debut album is dated 2000. What went on in the preceding 6 years? MB: Sadly my friend passed away not long after we started working together. His name was Roy "Spider" Godfrey. A really close friend and mentor in the art of recording. He had moved from England a few years before I met him and was also a Hawkwind fan and had some fond memories of seeing them perform in the early to late 70's and I was able to get him back up to speed on the more recent albums which he and his wife really enjoyed. I also have fond memories of sharing a spliff and either listening to his incredible music collection or simply drawing crazy little cartoons or some other form of artwork. Good fun. Not long after Spider passed away his wife also passed away so the studio was sold off. So for those six years I went to work organizing my own facilities. It was sometime in 1998 when I got it together to a degree that I was happy with so I started playing around with some ideas. It took me a little while to find a good second hand wavestation but once I did I was back into it again. 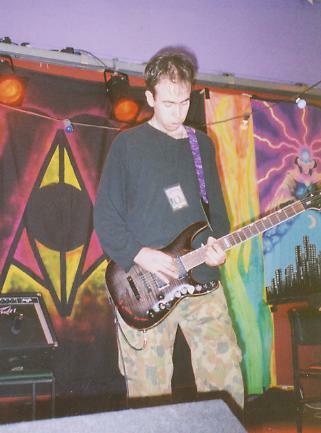 I actually finished the first Alien Dream in mid 1999 and contacted Andy Garibaldi at Compact Disc Services. He expressed an interest in hearing the music. He really liked it and later reviewed and added it to the CDS catalogue. AI: I don't think you mention it on your web site but there's a definite progressive rock element to your music and I continually make references to "space-prog" in my reviews. MB: I think that is a good way to look at it. To me Space Rock is definately an innovative and progressive style of music and has influenced many genres today. Rave, techno and tribal as I hear it are really space rock without the heavy guitars and thundering rock bass - not everyone's cup of tea but you can hear the influence space rock or space prog has had on it. Many of today's bands are indeed influenced by space rock and Hawkwind either directly or via other bands and so on. To be progressive I think is every musicians desire to constantly attempt to push the boundaries and keep it all fresh and exciting. Space metal for example. Arjen Lucassen springs to mind here. Extremely talented musician and a fan of Hawkwind / space rock. AI: When I first put Eleven Realms Of Night in my CD player I was surprised to see so many relatively short tracks. But as it played each song flowed such that it plays like one extended work. Does the album intentionally follow some kind of theme? MB: Recording the Eleven Realms was written during a somewhat bizarre time of personal goings ons.. I had recently returned from living in Lancashire England for a few months and after having completely fallen in love with Northern England I suppose I was feeling quite nostalgic about it. I ended up locking myself away in the studio for several months (studio hermit mode), recording from midnight until daybreak then sleeping most of the day. When I initially started working on the album I didn't really have any planned theme but during breaks in arranging and recording I would spend a fair bit of time gazing at the stars thinking about all kinds of things like ancient history, how things are now and the future and how peaceful and quiet everything was. I live very close to the ocean and can hear the crashing of the waves very clearly late at night so it was a very meditative time as well. As the music progressed it basically took on an expression of everything I was feeling and experiencing during those quiet times - a kind of fantasy journey of the mind exploring the dark deeps of space. AI: Though there are some longer tracks scattered across your catalog the song lengths are most typically in the 3-5 minute range. Any thoughts to doing some lengthy multi-themed stretch out works? MB: Yes. For a long time I've wanted to do a concept album all about the Moorcock story VON BEK. A brilliant storyline. I would have to make something like that a double cd affair tho! However, the next Alien Dream album, Dream Voyager, will have a couple of tracks that stretch out to the 9 minute + length. Its all about a group of various people of Earth who have undertaken a journey in a futuristic star ship in suspended animation - stasis - and are traveling across the far reaches of the universe to discover life sustaining worlds and hopefully other peoples. Where of course the grass will be much greener over there. During this journey they discover they can communicate with each other in their dream states and really begin to learn how powerful the mind can be and ultimately learn how unique and special Earth really was. AI: You made it over to the 2003 Hawkfest and performed with Tom Byrne. Having flown over from Australia how were you able to prepare? Did Tom already know the songs or did you have a chance to rehearse? MB: That was a blast. I really enjoyed every moment of it. The festival, the bands and the peace and spirit binding it all together and the vegetarian food was absolutely delicious! I realized that it was going to be virtually impossible to organize and fund a full band for the set so after contacting the management I began organizing backing tracks - sequencing etc. I had been in touch with Tom (a fellow Hawkwind fan) via the Hawkwind fan list at yahoo and he was interested in the idea of doing a set so I mailed Tom the backing and he added some synth parts that he would play and emailed mp3 mixes of that to me to hear. Tom also organized the sequencing side of things on his PC which he brought along with him to the festival with his keyboard. We had one night rehearsal at his house prior to the festival so everything leading up to that was practiced separately. I had really hoped that Alisa Coral (Space Mirrors) would be able to perform with us but unfortunately she was unable to make it at that time. In the end it all worked out quite well and I have just recently received the recording of our set which I am currently listening to. Good memories! AI: Has there been other Alien Dream live performances or is it primarily a solo recording project? MB: At the moment it is primarily a solo recording project though I did get together with some musos for a new years private party a couple of years back. Lights and smoke and all. AI: My first exposure to your music was the Space Mirrors album. How did that come about and tell me about the new album you and Alisa are working on. MB: I heard thru the Hawkwind grapevine that Alisa was a musician and had a very good album called Neutron Star so I got in touch with her and we agreed to send each other our music. I was extremely impressed with her cosmic space music sounds and she liked what I was doing so we decided to each write a track to send them to each other and I would add guitar to her synths and she would add synth to my guitar and see what happened. From there Alisa's vision of Space Mirrors grew. Alisa then arranged some very good tracks and mailed them to me on CD and I recorded guitars and mailed my contribution back to her. That is basically how "The Darker Side of Art" came to be. The new Space Mirrors album is sounding fantastic. It is titled "Memories of the Future" and based on themes of mysterious ancient races, ancient astronauts, the danger of big corporations taking over the world, the mystic search and Frank Herbert's "Dune" novels/movies. We have some talented guests appearing as well. Keith Kniveton has recorded a fantastic part on his mini moog. Martin from Litmus has contributed some great bass parts to one track and Metatron from The Meads of Asphodel has also done some superb vocals for the Dune track. AI: I'm very interested in the changing nature of music distribution in the internet age. So your mp3 subscription service really caught my eye. How has that been going? Do your foresee a time when the download will become THE standard for obtaining music and the iPod THE standard means of playing music? MB: It will be very interesting to see how things go in the future. Personally I think having a real album in my hands is better. Especially when a band has really cool artwork to go with the music and the quality of the sound is far superior on compact disc as opposed to mp3. Still there is a growing trend towards the mp3 format so keeping an open mind I thinks its ok to have an outlet for everyone. There has been good interest in the mp3 subscription on the website, however the disc option is by far the most popular. I must admit I am considering getting something for the car that can either play mp3 discs or store mp3 songs so I don't risk melting valuable discs. AI: Your bio makes a brief reference to being a painter of abstract art. Tell me about that. MB: I like to dabble in the world of color from time to time. Mostly doing unusual abstract, almost mandala style paintings. I had a few exhibitions about 10 years ago but haven't done anything like that since even though it was fun at the time. I really need to charge up the old digital camera and get some good pictures on the website - there's very little displayed there of what I actually have done. I also enjoy getting into Photoshop to design the artwork for my albums. AI: Have all your CD's except Samsara been self-released? I've not heard of Statue Records but has the association resulted in better distribution and exposure for that album? MB: Yes all the albums are self released. Samsara is both a self release and also released by Statue records. Statue has a very open contract allowing the band/artist to do as they please with their album. I have noticed quite an increase of traffic to the Alien Dream webpage and sales of Samsara so I would say that Statue have possibly helped in that regard. Though I never really had any grand expectations from them. AI: Your next album will be titled The Dream Voyager. Any suprises in store? When will it be available and will you be releasing it yourself? MB: Right now I am hoping to have it out by June or July. I plan to have someone else doing the artwork for this one so I am making arrangements for that. I think this one will fit comfortably into the Space-Prog genre. Some interesting tunes for sure! AI: Any other news you care to share? MB: I am hoping to get all the Alien Dream albums pressed by the end of the year as they are currently available on CDR. Right at the top of my wish list is to get out and do some live shows with Alisa as Space Mirrors in the near future. 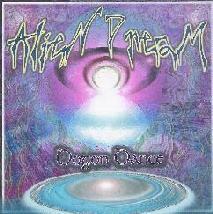 For more information you can visit the Alien Dream web site at: http://www.alien-dream.com. Listen to Alien Dream music at www.soundclick.com/aliendream. Visit the Space Mirrors web site at: www.spacemirrors.com.